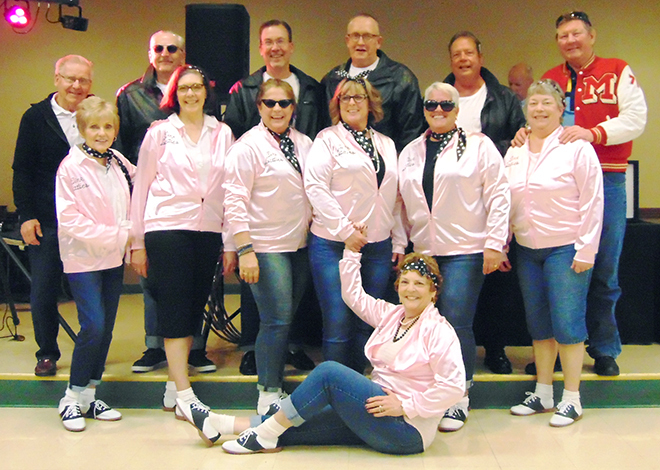 Pink Ladies and Greasers came togehter for a night of fun in honor of furthering educational opportunities at Hononegah High School. HOPE Foundation guests relived the 1950’s by wearing poodle skirts, polka dots, Bobbie socks, leather jackets and appropriate hair styles of the era on Saturday, March 9. Pink Ladies, greasers and friends enjoyed an evening of pure fun in the name of furthering educational opportunities at Hononegah High School. Table decorations consisted of sundae cups with overhead decorations of 45 records and dice hanging from the ceiling of the American Center. The 2019 Touch of the 50’s event was organized by Kelly Rosik and Diane Eymann. Millicent Christopher was the mastermind behind detailed decorations. Christine Lawver and Kelly Killion were recognized for their work on the silent and electronic auctions. Special thanks were expressed to: Jennifer Orsorio, Scott Robinson, Kate Tillman and Kristie Clark. HHS teacher, Tom Polaski gave positive opening remarks. “Welcome to the HOPE Community, HHS faculty, Administration and local dignitaries from the Village of Rockton. 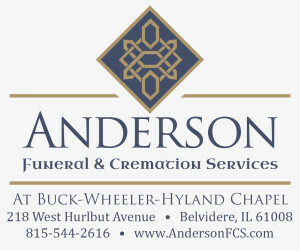 “I would like to remind everyone that April 5 is the Grand Opening of the fieldhouse,” Polaski said. Loud, supportive applause followed this announcement. Polaski introduced HOPE Foundation President, Bob Anderson who welcomed everyone and asked the HOPE Board of Directors to stand and be recognized. Anderson made special mention of Hononegah’s new Superintendent, Mike Dugan who was attending his first HOPE Foundation spring event. A social hour started off the event followed by dinner made by Mike Hall Catering. Ladel Cass gave the invocation prior to dinner. “It is great to part of this event and to see everyone coming so dressed up, “Cass said. Andy Gannon kept the fun rolling all night long by announcing cash prize winners, plus the winners of 50/50 raffles. Chances were taken on a stunning creation donated by the Gem Shop & Diamond Source. The Gem Shop is owned and run by Hononegah High School alumni Kevin Mueller who years ago formed a unique partnership with the Hope Foundation; now in its ninth year. The Jan Modersohn Memorial Scholarship was developed to honor the memory of former Rockton Village Clerk, Jan Modersohn who had a true passion for youth and education. In 2017 Mueller began working with a teacher at HHS to bring a segment on jewelry into an art class to the high school. This year’s one of a kind creation that was raffled off had a retail value of $, 2500. It is a 14k white gold vintage inspired ring with an oval Chrome Diopside, (1.01 ct.) with pearls and diamond halo accents. Gannon recognized the Hononegah’s Girls Basketball team on their recent third place victory at State. Friendly competition in the spirit of the event also included a silent auction where quality items were bid on; going home with the top bidder. Guest judges included HHS Alumni Scotty Bryden, and South Beloit Police Chief, Pat Hoey who chose winners in a dance and costume contest. Gayle Haab was named the winner of the dance contest. Jill Knoespel emerged the winner of the costume contest. Near the end of the Touch of the 50’s a $2,000 Grand Prize winner was announced and four winners of $500 each. The winner of the ring from the Gem Shop was Jackie Meiborg. The HOPE Foundation carries a stellar reputation in its mission which is to provide a means to enhance educational opportunities at Hononegah Community High School District 207. Since its inception in 1997 an endowment fund was established, and grants to be awarded for programs totaling $5,000 or more to Hononegah teachers and staff for programs to enrich the education of students. This program will additionally provide individual grants ranging to a maximum amount of $2,500. Last year’s Touch of Spring added over $10,000 to thee programs and endowment fund. HOPE Foundation also past projects sponsored a Heritage Mural featuring Stephen Mack and Hononegah, created by artist Michael Stiffler. This unique piece hangs on the wall of the HHS Performing Arts Center lobby. HOPE has also used a tax exempt status as intermediary that enabled the school to purchase a 40 acre tract of land for future use. In 2002 The Foundation has funded a 2nd semester tutoring program during the budget shortfall. Six teachers were paid and over 400 students benefitted. 10 years, helping to provide tools for a better education. Student scholarships have provided a convenient avenue for many induvial and organizations to give funds for specific scholarships. In 2011 the HOPE Foundation purchased two portable AED’s for the athletic department to allow traveling teams to have them available at remote venues. That same year funding helped to purchase retractable batting cages. In 2014 they sponsored a facility renovation feasibility study. In 2018 HOPE put $25,000 toward new Digital Scoreboards. The 19th annual HOPE Foundation Touch of Spring event will help to continue growing options of furthering educational opportunities at Hononegah High School.